A nutty and savory treat, perfect for this festive season! A nutty and savoury treat, perfect for this festive season! 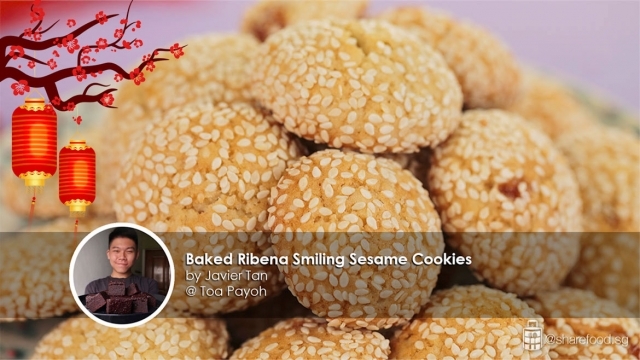 This Baked Ribena Smiling Sesame Cookies recipe is so addictive that you won’t be able to keep yours hands away! 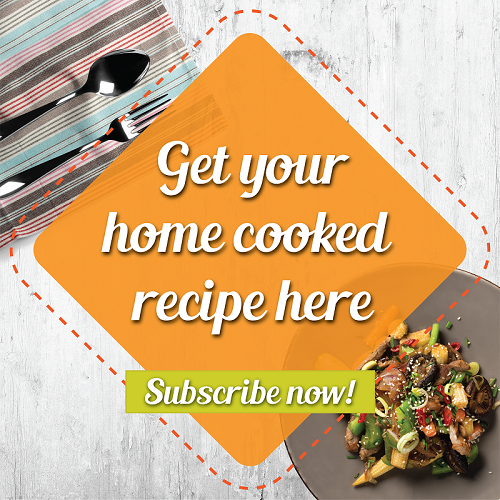 This recipe is shared by our home cook, Javier Tan. Did you know that the reason why these cookies are named “smiling cookies“ is because when the dough is being baked, due to the heat, it will crack open and therefore, resembling a smiley face? Also, this recipe takes only less than an hour to make. There’s no excuse not to bake these! So, here are some of the ingredients that you would need : 200g of All-Purpose or Plain Flour, 125g of granulated white sugar, 6g of baking powder, ¼ teaspoon of salt, 35ml of Ribena Blackcurrant fruit drink, 75g of unsalted butter, 1 large egg, 150g of sesame seeds – a mix of 75g of black and white untoasted sesame seeds each, 1 packet of Ribena Pastilles cut into quarters, and lastly, ¾ teaspoon of vanilla extract. Remember to double the measurement if you are using vanilla essence instead! Next, let’s move on to prepare the cookie dough. First, sift in flour and baking powder in a bowl and set aside. In a stand mixer bowl, add in unsalted butter and granulated white sugar and attach the paddle to cream the butter and sugar till it turns pale yellow. The mixture should come out light and fluffy! Using Ribena Blackcurrant Fruit Drink acts as a baking soda and helps to fluff up the cookie it is also a substitute for sugar which is a much healthier option! Mix the batter well and don’t worry if you see the mixture slightly clumpy! Then, add in the egg and beat on medium speed till well combined. Here’s where your Ribena Blackcurrant Fruit Drink comes in! 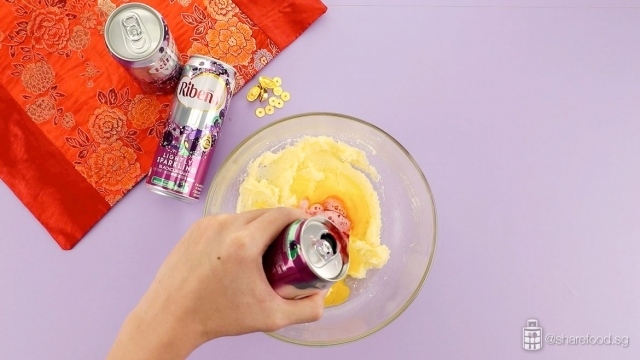 Ribena Sparkling Blackcurrant Fruit Drink acts as a baking soda and helps to fluff up the cookie and it is also a substitute for sugar which is a much healthier option! So, add the drink, vanilla essence and salt and beat on medium speed. Don’t worry if you see the mixture slightly clumpy! Next, add in flour and baking powder into the batter and mix well. The mixture will be mixed well together by now and proceed to wrap the dough with a cling wrap and transfer it to the chiller for an hour or overnight to firm it up! 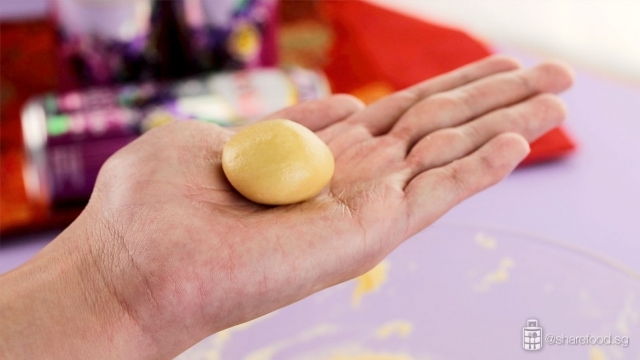 Roll 18g of cookie dough into a ball shape and flatten it with your palm. It’s time to assemble for baking! Preheat the oven at 180oC for at least 10 mins and line the baking tray with parchment paper. 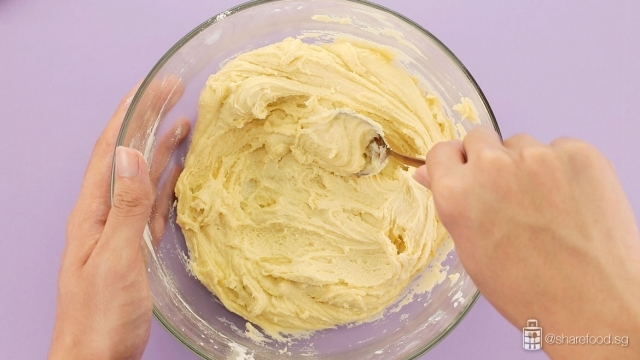 Roll 18g of cookie dough into a ball shape and flatten it with your palm. The pastille will be a fruity surprise when guests bite into the cookie! So, wrap the quartered Ribena Pastille within the dough. Try not to use too big of a portion of Pastille. Next, coat the cookie dough in a bowl of sesame seeds and place it on the baking tray. Do remember to line then 5cm apart as the cookies will inflate as it bakes! The cookies will be ready in 11-15 mins when the base of the cookie turns brown. Do remember to line then 5cm apart as the cookies will inflate as it bakes! The cookie is still soft after baking. To maintain the shape of the cookie, it’s important to let it cool down before transferring the cookie on the tray to the wire rack. Keep it in an air-tight container once it has completely cooled down. Don’t worry! You can store your cookies at room temperature for up to a week, but they are best consumed within 3 days. 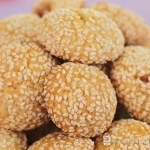 You’ll be able to bake these cookies beforehand and impress your guests this festive season! You can store your cookies at room temperature for up to a week, but they are best consumed within 3 days. 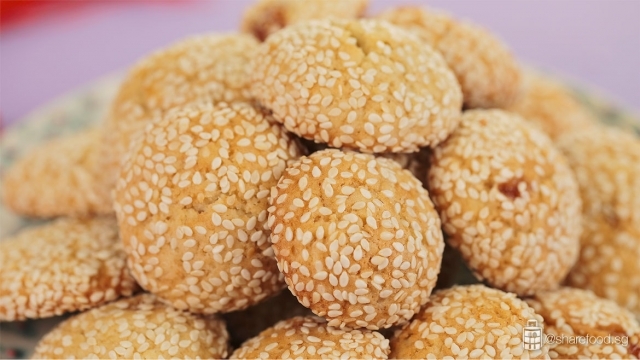 Sesame seeds is filled with many health benefits such as preventing diabetes, lowering blood pressure and many more! Try out this recipe for yourself. 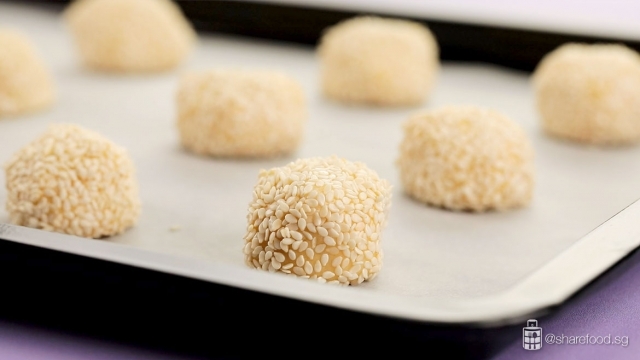 These mouth-watering healthy treats is a must-have this Chinese New Year! In a bowl, sift in flour and baking powder. Set aside. In a stand mixer bowl, add in unsalted butter and granulated white sugar. Attached the paddle and cream the butter and sugar till it turns pale yellow and the mixture is light and fluffy. Add in the egg, beat on medium speed till well combined. Add in flour and baking powder into the batter. Beat till well mix. It is ready when the final mixture comes together. Wrap the dough with a clingwrap. Transfer to the chiller to rest the dough for at least 1 hour or overnight to firm it up. Portion 18g cookie dough. Roll it into a ball shape. Flatten with your palm and wrap the quartered Ribena pastille within the dough. Do not use too big a portion of Pastille! Bake for 11 – 15 mins. It is ready when the base of the cookie is browned. Allow the cookie to cool on the tray before transferring to the wire rack. 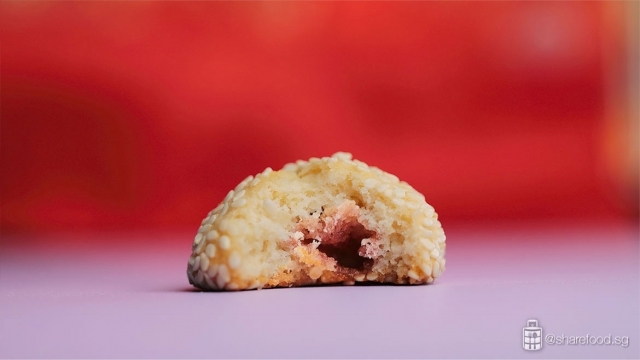 #Tips: The cookie is still soft after baking. Hence, to prevent disfiguring the cookie, it’s important to let it cool before transferring. You can store them at room temperature for up to a week, but they are best consumed within 3 days.